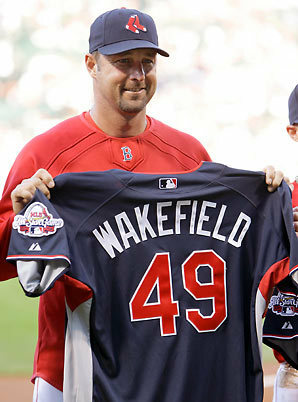 Tonight at approximately 5PM, Tim Wakefield will announce his retirement from baseball at the age of 45. "Wake" will finish his 19 year career with 200 wins, a feat he reached this past September. His career accomplishments also include 2 World Series rings, an All-Star berth in 2009, 1995 AL Comeback Player of the Year, and 2010 Roberto Clemente Award winner, an honor he was nominated for eight times. To Sox fans however, the knuckleballer will be remembered for being a world class team player who's sacrifices as a pitcher and an athlete in general are unparalleled. He was constantly asked to change his roles from front line starter, to middle reliever, and even a successful stint as a closer. This was something that most fans thought was easy since his style allowed it, but Tim has come forward recently as saying it was extremely difficult and uncomfortable. In my mind, all you need to know about Wake happened in 2007. After finishing as one of the more reliable starters for Boston with a 17-12 record that season, he volunteered his roster spot in the World Series for a healthier rookie, Jon Lester, who won the clinching game against the Rockies. Name the players who have done that in the history of professional sports and you will undoubtedly come up with a very short list. After being drafted as a first baseman by the Pirates in 1988, a scout told Wake that he would never make it above the AA level as a position player. Doing "anything he could to make it" Wakefield began to develop a knuckleball, and the rest is history. He burst onto the scene for Pittsburgh in '91, throwing a complete game with 10 strikeouts against the Cardinals in his Major League debut. He finished the season as the best rookie NL pitcher with an 8-1 record and 2.15 ERA. More impressively, Wakefield beat Tom Glavine in both of his NLCS starts that year, a series that he would have been the MVP of if not for a game 7 collapse in the 9th inning against Atlanta. After having control issues, Wakefield was released and picked up by Boston, and went on to have one of the best careers by any Boston pitcher in the 100+ years of the team. Here is where he ranks on the all time lists. A Red Sox Hall of Fame career from one of the classiest and hardest working athletes this region has ever known. RTB wishes Wake a great retirement.